The Alinghi X40 team racing in the iShares Cup in Cowes won the event with a five point lead over Team Origin, the British America’s Cup team. In the historic home of the America’s Cup, the Defender dominated arch rivals BMW Oracle Racing, which had two teams on the water helmed by James Spithill and Franck Cammas. Marian Martin spoke to Franck Cammas in his native language, after the racing. 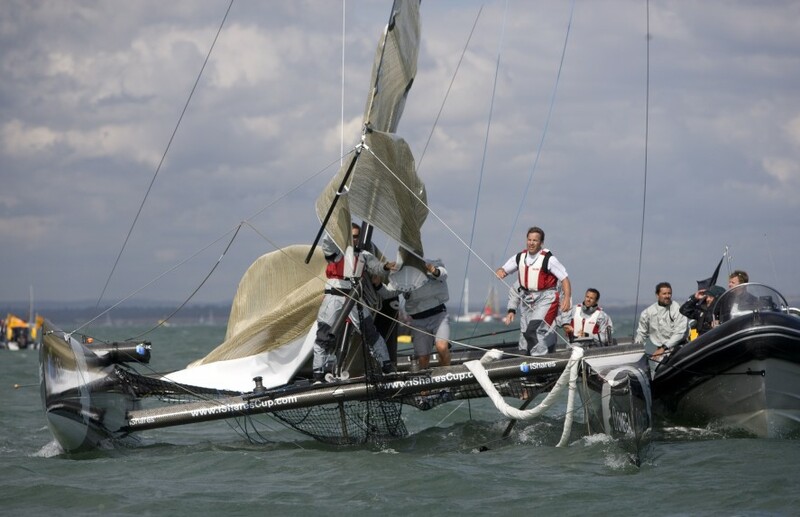 Everything started very well for you in Cowes, with two wins, then you had the collision with BT. Can you explain how that happened? Often when you�re racing you all get to the windward mark together, and when we were on port tack with other boats downwind of us, BT and James Spithill on the other BMW Oracle; all 3 of us had to bear away and Alinghi was on starboard tack when BT closed the door on us so there was no room to luff again between BT and Alinghi. As a result we were left with no choice and unfortunately made contact! What do you think of Ed Baird's performance, in his first season in multihulls and Jimmy Spithill who achieved wonders today? It�s Ed Baird's 3rd event in the Extreme 40 and he�s been very regular and performed well at the front of the pack. He�s always managed to maintain that, which shows that the crew performs very well and has good speed. Effectively, this proves that you have to train well to win this type of race. We had a few concerns with capsizing, so we couldn�t hope to compete for outright victory, but we were nevertheless in the thick of the action. James had a superb day today, with 4 race wins and he was very regular. You certainly have to be able to adapt to this type of boat and James is already performing well. 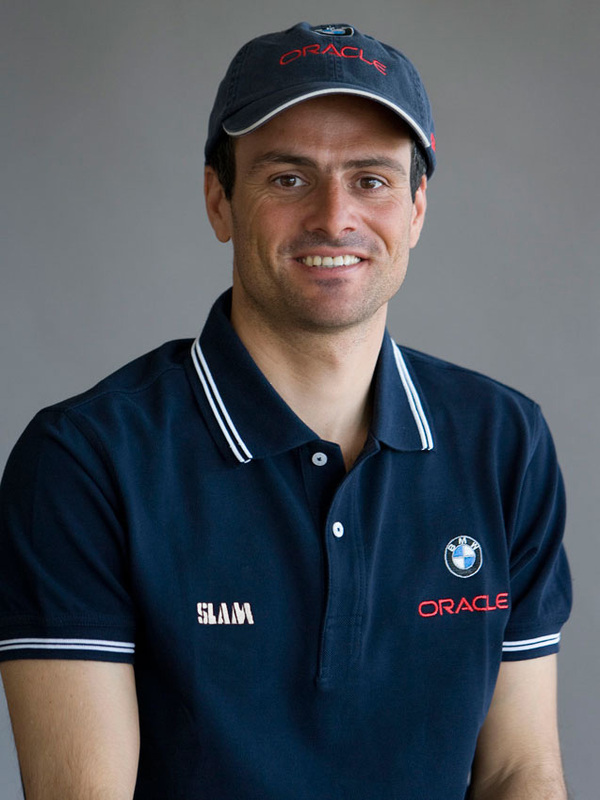 Can you explain how you came to join the BMW Oracle team? Initially I was just a member of the design team together with the architect Vincent Lauriot-Pr�vost to help design the future boat for the America�s Cup. The idea was that he�d bring his design experience into the equation and my input would be linked to my experience of sailing a multihull. Now, I'm involved in the sailing, from the Extreme 40 to bigger multihulls like Groupama 2, on which we have performed a number of training sessions and, eventually, we will all sail together on the larger multihull. You have a contract with Groupama until 2016 (I think); is Groupama concerned that your participation in the Cup could interfere with a Round the World and other record attempts? My priority remains with Groupama and we have some long term objectives together including the round the world record attempt aboard Groupama 3, the Route du Rhum in 2010 etc so there�s a set programme with Groupama 2 and 3. In between times I have the possibility to devote time to BMW Oracle Racing and continue to make progress in the short races. For the past 2 years, there haven�t been any Grand Prix in the 60 foot multihull circuit so these little races with BOR enable me to keep my hand in. With all this racing on different platforms there is the opportunity to exchange a lot of ideas between the different parties and learn a great deal. Which type of event do you prefer - offshore or inshore? I like both. Days like today are very, very exciting, with short inshore races, where there�s a great deal of contact and you�re constantly on the alert. They don�t really share the same philosophy or the same approach as when you�re racing offshore. I�ve always liked both of them even though they�re very different. I couldn�t see myself racing solely offshore. What I like about the 60� multihulls is that there are crewed Grands Prix and single-handed offshore races, which are two things which are the exact opposite of the other. The Extreme 40 is on the up and up, whilst the ORMA is practically dead. do you know the reason? The reasons aren�t very objective at times. At one point it was a question of budget, but then the monohulls were just as expensive as the multihulls. Then it was a matter of scheduling and the fact that the Grand Prix attracted so few people. With the Extreme 40s it�s the same kind of racing as we did on the 60 footers, but on much smaller boats. Here, with 40 foot racing, there�s slightly more margin for error. If you capsize on the 60s then your whole season goes to pot so maybe it was a bit too ambitious, but there are still lots of 60s in existence and out sailing. The series could get going again very quickly if the skippers and race organisers could be found. The 60 foot multihull circuit is a great series and the boats are really exciting. The minute we invite people from the America�s Cup like BOR to sail aboard, say Groupama 2, they�re very enthusiastic and really want to keep sailing them. Unless GGYC wins its appeal, there won't be a DoG match in multihulls. Will that be very dissappointing for you? Yes, I�d be very disappointed as I think it would be great in sporting terms, even if there are only 2 boats. The boats would be exceptional and unlike anything there's been before, which would provide some stunning images. The crews are very excited both on Alinghi and on our behalf in particular. They�re very enthusiastic about sailing on this type of boat. We already had a taster of that together aboard the 60�, which we imagine will be on yet another different scale to what they�ll race in the America�s Cup. When I sail on this size boat in the inshore races it�s a real thrill, especially for the French as it enables those of us with multihull experience to integrate a team and bring our knowledge to the plate. As a result, it�s a way of getting a foot into the America�s Cup environment via a different route to normal. There are a number of sailors who�d like to participate in this fine adventure; design is another element of this, with sailors providing their input. We share a lot on the water, so we both achieve similar results and it�s been nice to be able to combine all that knowledge as we make a lot of progress on both sides. If there is a DoG match are you hoping to helm BMW Oracle? I haven�t really thought about that yet. In any case it�ll be Russell Coutts who will decide. You also have to have the best crew aboard and ensure that the boat is in the best possible condition etc. We�re going to concentrate on sailing the boat well together and then we�ll see. All the people at BOR are very talented and that�s good as they motivate each other to drive the future boat as best they can. 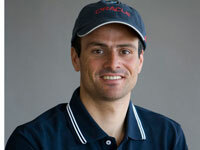 Do you have any ambitions to stay with BMW Oracle even if AC33 is in monos? I don�t think that would be possible as I was really called in especially for my multihull experience. It�s evident that they have all the experience they need already to sail an America�s Cup Class monohull. We've seen at Cowes, several capsizes and a good deal of damage and we must accept the possibility that a DoG match could end with a wrecked boat, maybe two. What can BMW Oracle do to minimise the risk of catastrophic failure? What we try to do is to prepare the boat very early on and to know the boat inside out and learn how to sail it. We have to study all the different configurations in relation to the weather as, no matter what the race zone, even in zones that are supposed to be windless, there can always be strong winds. Safety always has to be a priority especially on multihulls as they don�t allow any margin for error. In monohulls the boats broach, if you don�t have the right sail area. In multihulls you flip, which leads to a lot of damage on the big boats so the best way to avoid this is to know your boat, focus on each race, never exceed the capabilities of either the boat or the crew at the start of the course and take the necessary time to work the boat and the crew up. Groupama 2 and 3 are built for variable conditions, the boats for a DoG match will be made for more specific conditions. BMW Oracle doesn't know the venue, so doesn't know the conditions. Is that a big disadvantage? Yes, it�s a disadvantage for the America�s Cup challenger, but those are the rules and they�ve been around for 200 years. The spirit of the America�s Cup has always been like that. The Defender has a few advantages as regards the choice of venue etc, but that�s about all, other than the fact that it has the advantage of building a slightly larger boat. BOR has already challenged with a 90 foot boat and, with the Deed of Gift, there�s the possibility of building a slightly bigger boat with two masts. On the other hand, as I said before, I think you really have to avoid boats that are overly specialised as there are a lot of race zones reputed to be windless and you can have boats designed for very light airs as a result, but then the wind can easily kick in strongly all of sudden, so you have to envisage every scenario on this type of boat. In contrast to monohulls, sometimes on a multihull you�re compelled to reduce the sail area considerably; we see this on the lake, with the boats that are exceptional in light airs, when a storm suddenly arrives, or a squall it can turn into a war zone on deck. On a little boat of 35 feet war is one thing, on a very big boat making war is very, very dangerou. So, you have to be very careful not to make the boats too extreme. As the Defender knows the venue 6 months prior we have to design a boat that performs well in all conditions. Do you think the two boats will have similar performance, or not? For the little boats there are designers that have a good understanding of this type of boat, so you can expect a great competition on the water with all the boats fairly homogenous. They may involve different philosophies, trimaran/catamaran, big/small, narrow/beamy etc. Even with different boats, whatever the theoretical performance, we can often see that - on the water - they have a similar performance in a range of conditions. It can be a great challenge for the designer and the sailors, as the performance and hence the racing will be close. Let's talk about Groupama 3 – how are the repairs going? Things are progressing as they should. We decided, after one float broke, to change the other one too, so the repairs will take quite a while. The relaunch is scheduled for next February and then we’ll begin training again with a view to a future record attempt the following winter. What effect will the added weight have on the performance? An increase in weight is never a good thing in quite a few conditions and in light airs in particular. However, we�re compelled to add weight to the original design so that�s what we�ll do. A few hundred kilograms will have to be added so of course we�ll try to remove this elsewhere on the boat such as in the comfort elements so we can try to retain the same performance. Our priority though is on the safety of the crew in the round the world and trying to do the best we can.